Biblicism, an approach to the Bible common among some American evangelicals, emphasizes together the Bible's exclusive authority, infallibility, clarity, self-sufficiency, internal consistency, self-evident meaning, and universal applicability. Acclaimed sociologist Christian Smith argues that this approach is misguided and unable to live up to its own claims. If evangelical biblicism worked as its proponents say it should, there would not be the vast variety of interpretive differences that biblicists themselves reach when they actually read and interpret the Bible. 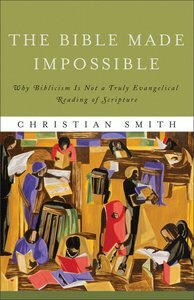 Far from challenging the inspiration and authority of Scripture, Smith critiques a particular rendering of it, encouraging evangelicals to seek a more responsible, coherent, and defensible approach to biblical authority. This important book has generated lively discussion and debate. The paperback edition adds a new chapter responding to the conversation that the cloth edition has sparked. About "The Bible Made Impossible"
Christian Smith (Ph.D., Harvard University) is the William R. Kenan Jr. Professor of Sociology and director of the Center for the Study of Religion and Society at the University of Notre Dame in South Bend, Indiana, where he has been cited as an outstanding faculty member. He is the award-winning author or coauthor of numerous books whose research focuses primarily on religion in modernity, adolescents, American evangelicalism, and culture.